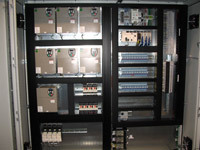 We are an UL/cUL approved panel shop that puts emphasis on quality built control panels. We can custom paint and custom cut holes in any size or type of enclosure. Our panels are built for a variety of industries and are shipped all over the world. We can provide AutoCAD drawings with panel layouts, wiring diagrams and schematics.